BIG NEWS FOR ALL YOU COLORING ENTHUSIASTS! Whether you’re new to this website, have just been keeping your eye on it, or have actually colored some of my unusual icons of Aztec deities, you’ll find my overhauled coloring book now has a lot more to offer. While there are no more icons beyond the currently completed 13, each is now accompanied by a page with its descriptive caption and full-color images from the Aztec Codices that served as models for drawing the icon. Those images will give a good idea of the varying styles of the ancient picture-books and maybe even suggest authentic colors to use in your own coloring. Check out this example of the caption/model page for CHALCHIUTLICUE, the Jade Skirt. As before, all the icons can be viewed or downloaded individually from the coloring book page, either as a pdf file with caption/models page or as freely sizable vector drawings. But now they are also all bundled together into an actual book: YE GODS! THE AZTEC ICONS. But that’s almost the least of the overhauls. 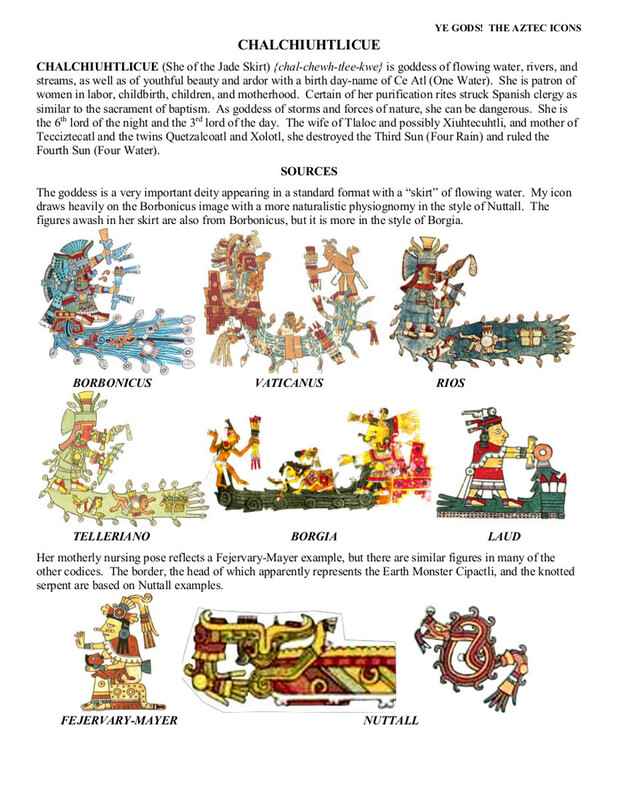 In addition to that book, there is now a major revision and expansion of the earlier catalog and appendix—a complete illustrated encyclopedia of essentially all the Aztec deities: YE GODS! THE AZTEC PANTHEON. 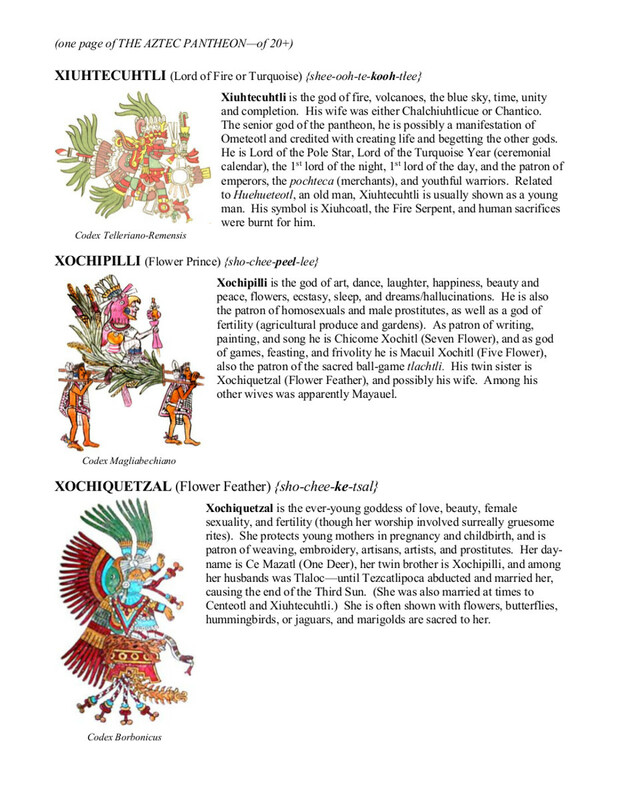 Its 88 alphabetical entries include some 1,300+ divinities (depending on how you count), and there’s usually an authentic image for each selected from the Aztec Codices. Again, the images illustrate their varying styles and provide even more suggestions for coloring the icons. Of itself, YE GODS! THE AZTEC PANTHEON amounts to a crash course in ancient Mexican mythology, history, culture, and art. YE GODS! 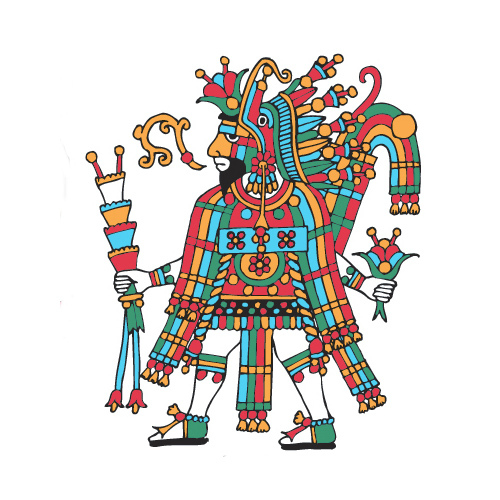 THE AZTEC ICONS takes this another step further—into illustrating details of Aztec society. For perhaps excessive example, with Huehuecoyotl, the Old Coyote, there are vignettes of people playing musical instruments, singing, and dancing; with Huitzilopochtli, Hummingbird of the South, there’s a pictorial narrative of the legendary migration of the Aztecs to Tenochtitlan; with Mictlantecuhtli, Lord of the Land of the Dead, there’s a vague map of the soul’s way to Mictlan; and with Patecatl, God of Medicine, there are scenes of medical practices and medicinal herbs. Each icon contains its own type of social commentary. I haven’t quite started on Aztec Icon #14: Quetzalcoatl, the Plumed Serpent, but hope to do so shortly. In the meantime, I’m working on yet a third component of my Aztec project, another section on the Aztec Codices themselves. It will be a description of and commentary on each of the 15 surviving picture-books, including sample pages and Internet sources to view the whole documents. I perhaps unrealistically hope to complete it in the next couple months, and guess what: I’ll call it YE GODS! THE AZTEC CODICES. Watch for a post announcing it.